Felina the Florida panther loved growing up in her forest home, until the forest starts to shrink! Trees begin to disappear and Felina doesn’t understand the new busy highway in the neighborhood. Other animals are in danger, too. Will Felina find a way to survive as humans threaten to ruin her home? 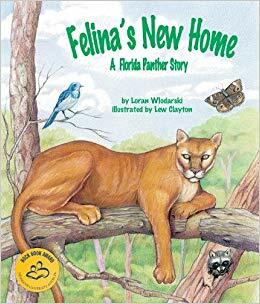 Environmental science writer Loran Wlodarski gives children a look into deforestation and endangered animals in Felina’s New Home: A Florida Panther Story, complemented by the detailed, emotive illustrations of Lew Clayton. Learn whether the animals in Felina’s forest adapt to the new human presence and what children can do to keep wild animals safe, happy, and healthy.